A lot has happened since Clark Kent returned to Metropolis at the beginning of the season. Kara has dealt with new friends, new enemies, and a new job. The President visits National City to sign an extraterrestrial amnesty act, but Supergirl has to protect her from a rogue alien's attacks. -Lena Luthor. Basically, I will take anything with Katie McGrath. She's marvelous. -The Alien Amnesty Act. This was a great plot I hope they return to. It's very relevant to today's politics also. I also liked that Kara changed her mind about Mon-El. -J'onn finding another piece of Mars with M'gann M'orzz. He needs more happiness in his life. -Lynda Carter aka the President of the United States. Amazing, really. I love the cameo. -Kara and her reporter job. I'm just not feeling it. She doesn't seem like a reporter. I know she still has a lot to learn, but it's just a boring, cliche way to create tension in the Catco office. Kara uncovers a secret alien fight club run by Roulette and is determined to dissolve it. -Maggie. She seems pretty cool, and it can't hurt to have yet another awesome female character on this show. -Alien bar. I like this location; it's pretty cool for Kara and J'onn to have a place to meet other aliens. It's nice for them to know they aren't alone. -Roulette. She's a conniving little something. I didn't necessarily hate her, but she's not good news. I look forward to seeing her again. -Mon-El. I know he's new to the whole earth thing, but it irritates me that he can't just listen to Kara. Apparently alien boys can also be stupid sometimes. -Martian fight. It was painful to watch J'onn fight M'gann. What's worse is that M'gann isn't a green Martian; she's a white Martian, which is not good. Cadmus gives a ruthless gang weapons to fight aliens, and Kara has to find a way to stop them. -Mon-El in the real world. This episode was great due to Mon-El trying to fit in with the world. His outfit was adorable, and I liked how oblivious and dense he was about everything. -Lena Luthor calling on Supergirl's aid. It's lovely. She's lovely. Give me more Lena. -Kara trying to juggle being both Kara and Supergirl at Lena's gala is what I live for. -James trying to be a hero. I know he has good intentions, but I just think it's going to turn out bad. Do we really need another hero on this show? And one without super powers? An alien parasites attacks, which drains Supergirl of her powers and forces James as The Guardian. -Alex and Kara's sister relationship. This episode was especially important in revealing their strong sister relationship. I'm glad they continually portray not only a strong relationship but a realistic one. -Mon-El to the rescue. I liked watching him turn around from his petty actions and attitude to be heroic. It was a nice change, and it made me love him even more. -The Parasite. It's super creepy, and I don't like it. Nope. No thanks. Also, the parasite host was played by the creepy Ethan dude from Lost. So double no thanks. -James as The Guardian. Ugh, just stop. Your costume is actually lame. I don't care. Cadmus kidnaps Mon-El and uses him as bait to lure Kara to their labs. Once there, she comes face-to-face with Cyborg Superman. -Cyborg Superman. This was an interesting twist. Hank Henshaw is not actually dead, but he's been turned into a cyborg, fulfilling the character's comic book role. I hope he proves to be a worthy adversary. -Jeremiah is alive!! Jeremiah is alive!! I'm so happy and he's a good guy and he's helping people. I'm so excited. -Mon-El totally likes Kara, and I am a happy shipper. Now I just have to hope the writers don't ruin their relationship like they did with all of Kara's other relationships. -Cadmus. Those no-good, dirty-rotting alien kidnappers! It was so sad to see Kara and Mon-El locked and tortured in Cadmus Labs. -Fortress of Solitude. It's not good that Cyborg Superman has access to the Fortress of Solitude or Project Medusa. Not good at all. -Martian fight 2.0. J'onn learning the truth about M'gann was sad and heartbreaking. Their second fight was worse than the first, and the absolute hate that J'onn has for White Martians was devastating. 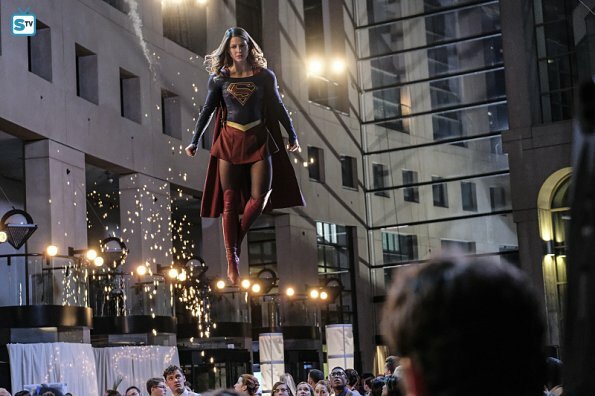 Overall, Supergirl has had a pretty up and down season so far. It's definitely better than season one, but it still has a ways to go. I'm excited for the four-part crossover with heroes and aliens! What do you think of Supergirl season two so far?